A new non-toxic method for delivering anti-cancer drugs to specific parts of the human body could mean the end of the severe and nasty side effects associated with many cancer therapies, according to researchers at Cardiff University's School of Pharmacy and Pharmaceutical Sciences. The method involves the use of a new type of a nanotube – a tiny tube used in many applications, including drug delivery. This new type, designed and created by Dr. Ben Newland at Cardiff University, is made from a non-toxic polymer called poly(ethylene glycol). 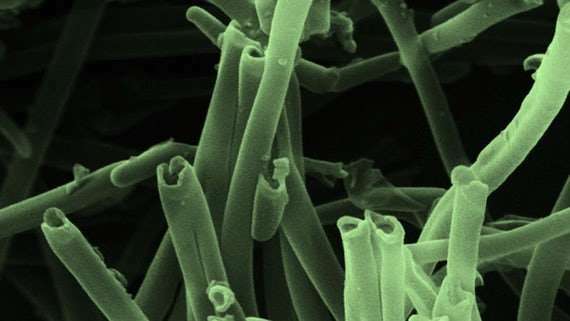 Unlike current nanotubes, which can cause asbestos like toxicity, these new versions are soft, flexible and biocompatible, meaning they should be well tolerated by the body. It's thought that not only could the development of this new nanotube provide a better way of delivering anti-cancer drugs, it could lead to far less side effects too. That's because, currently, many drugs used in chemotherapy to treat various forms of cancer are administered through an injection into the blood stream. Although these drugs reach cancer cells, they also negatively impact on perfectly healthy cells causing an array of harsh side-effects including hair loss, sickness and extreme fatigue. The new nanotube has the potential to be injected into a specific part of the body, which means the rest of the body is left largely unaffected by the toxic anti-cancer drugs. To explore this further, research looking at how effective this new nanotube could be in treating breast cancer was carried out. A drug called Doxorubicin was administered through the nanotube and was compared to the same dose of the same drug being injected into the bloodstream. The findings revealed a reduction in both the rate of metastasis (cancer spreading) and the rate of tumour growth through the nanotube delivery method, giving the research team hope that the development of the new nanotube could lead to more effective cancer therapies in the future. Speaking of these findings, Cardiff University's Dr. Ben Newland commented: "With the development of a brand new type of nanotube, we are in unchartered territory. We are in the early stages of this research, but it's exciting to think about the potential improvements in the way that drugs are delivered." The research project is a collaboration between Cardiff University's School of Pharmacy and Pharmaceutical Sciences, the Leibniz Institute of Polymer Research in Dresden and the University of Strathclyde and has been funded by the Welcome Trust. Full details of the findings of this research are published in an article entitled "Soft and flexible poly(ethylene glycol) nanotubes for local drug delivery" in the journal Nanoscale.